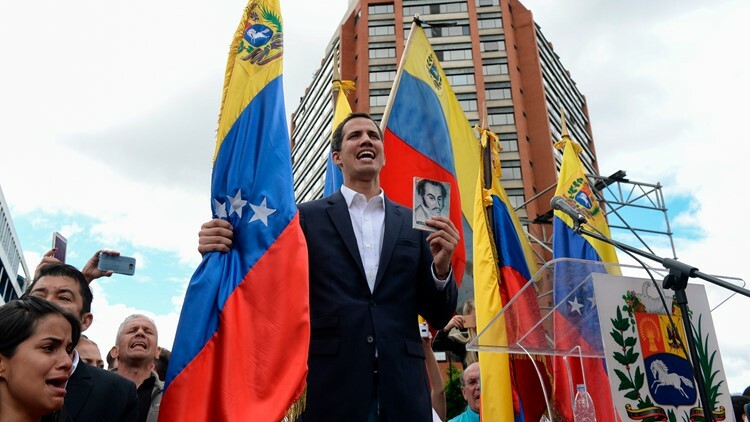 Venezuela's National Assembly head Juan Guaido declares himself the country's "acting president" during a mass opposition rally against leader Nicolas Maduro, on the anniversary of 1958 uprising that overthrew military dictatorship in Caracas on January 23, 2019. The White House supported Juan Guaido, the head of the opposition-controlled congress, when he declared himself interim president. The bold challenge to Maduro's rule immediately drew recognition from the Trump administration, which called on Maduro to resign and said it would use the "full weight" of U.S. economic and diplomatic power to push for the restoration of Venezuela's democracy. Canada as well as Brazil, Colombia and several other Latin American nations followed suit in throwing their support behind Guaido. Maduro did not immediately respond. But socialist party boss Diosdado Cabello, widely seen as the No. 2 most-powerful person in the country, blasted the U.S. and its "lackeys" in the region for trying to topple Maduro by violent means. "The Bolivarian revolution doesn't have an expiration date," he told a crowd of red-shirted government supporters who then headed to the presidential palace, where Maduro was expected to address them. President Donald Trump, Vice President Mike Pence and Secretary of State Mike Pompeo all issued statements proclaiming U.S. recognition of Guaido and saying the U.S. would take all diplomatic and economic measures necessary to support a transition to a new government. "The people of Venezuela have courageously spoken out against Maduro and his regime and demanded freedom and the rule of law," Trump said in his statement.